The History of Nigeria since 1969 is about three men: Dr. Olusegun Obasanjo, Gen. Muhammadu Buhari and Dr. Goodluck Jonathan. I will aptly describe them as President General, President and President at large. The trio constitute the Presidium, even if we are not Communists. The recent letter to President Buhari could only have come from his former General Officer Commanding[GOC] and Commander-in-Chief. And Dr. Obasanjo’s points made a lot of sense. I am sure many of us have noticed that the image makers domiciled in Aso villa have not fired lethal shots yet. On the part of Dr. Jonathan, he has since gone back to Abeokuta to reconcile with Obasanjo, the man who lifted him from the Creeks to the crown in less than four years. This same Obasanjo who had a running battle with Buhari as President between 2003 and 2007, teamed up with Buhari to flush out Jonathan in 2015. To the uninformed, the three appear to be fighting themselves, sometimes but are indeed, united in their bid to control Nigeria. And the head of this triumvirate is General Obasanjo, the Balogun of Owu. All three have a lot in common. Obasanjo was largely unknown until May 21, 1969 when General Yakubu Gowon made him GOC, Third Marine Commando Division of the Nigeria Army in place of Col. Benjamin Adekunle. An Army Engineer who trained at the Mons Officer Cadet School, Aldershot, taking over from a Sandhurst groomed officer. Lucky man, Obasanjo brought the Civil War to a close when the Biafrans surrendered to him at Amichi before Dodan Barracks hosted the formalities on January 15, 1970. Not much was said about Sandhurst trained GOCs like Cols. Mohammed Shuwa, Murtala Mohammed, Ibrahim Haruna and Iliya Bisalla. That was the beginning of the rise of Obasanjo. Gowon later picked him as Federal Commissioner[Minister]for Works. In 1975, he became Chief of Staff, Supreme Headquarters[Vice President] under Murtala. Obasanjo capped it all in February 1976 when fate made him number one, following the assassination of the head of state. Obasanjo has not left Nigeria ever since. He had a hand in the emergence of Alhaji Shehu Shagari as President in 1979. Many of his kinsmen still believe he preferred Shagari to fellow Yoruba, Chief Obafemi Awolowo. As Obasanjo moved out of power, Buhari was on the rise. Under the civilians, the latter was made GOC 3rd Division. We all have not forgotten that the former also was GOC 3rd Marine Commando Division. Buhari was outstanding as he repelled attacks by Chad and was almost capturing Ndjamena before he was reprimanded by Shagari. Buhari would later oust Shagari in December 1983 with the support of young officers, and the duo of Ibrahim Babangida and Sani Abacha. IBB sacked Buhari in August 1985, and put him in detention. At that time, Obasanjo wanted to become the first African to lead the United Nations. He did not succeed. The Commonwealth recognized him as an eminent person. Three months after Babangida stepped aside in 1993, Abacha struck. Buhari was relevant again with the Petroleum Trust Fund [PTF], an agency which controlled more funds than many states. Obasanjo was taken to jail on allegations of coup plot. From prison, IBB and Abdusalam Abubakar, planned an Obasanjo presidency. The Yoruba did not buy into it but it worked. OBJ stayed in power for eight years, fished out Jonathan who moved from Deputy governor to Governor, to Vice President and to President. In 2015, Obasanjo abandoned Jonathan and voted for Buhari. Let us see what holds them together. Obasanjo, like Buhari, graduated from Mons. And you cannot locate the Academy anymore because it was scrapped in 1972. Obasanjo was GOC during the Civil War and Captain Buhari served under him as Acting Commander 16 Brigade when Maj.E.A. Utuk was on leave. Obasanjo described Buhari as “ a concessional commissioned officer” and “a field commissioned officer.”Buhari fought in Owerri where one of Obasanjo’s friends, Col. Patrick Amadi, hailed from. Obasanjo made Buhari, Minister of Petroleum. The former was a minister under Gowon. Obasanjo was Head of State and later president, just like Buhari. As president, they held on to the Petroleum Ministry as minister. 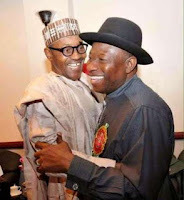 There is an accord that binds Obasanjo and Jonathan. As number two, OBJ stepped in after the number one, Murtala, died. The same happened to GEJ when President Umaru Yar’adua died in 2010. No two the Vice President [or equivalent] enjoyed that uncanny luck. One of Obasanjo’s wives, Stella, had an Igbo mother from Delta. Mrs Patience Jonathan’s maternal home is Umuahia, Abia State. Mrs Obasanjo died during the Obasanjo Presidency. Jonathan lost his brother, Meni, while he was president. Obasanjo’s first job as GOC began in Port Harcourt at a time the Garden City was capital of Jonathan’s state, Rivers. Jonathan’s first job after graduating from the University of Port Harcourt was at Ebekun Community School, Iresi in Obasanjo’s Yoruba land. Ebekun sounds like Ibogun, Obasanjo’s ancestral home. Jonathan bagged a PhD before he became President. Obasanjo did after leaving office. Obasanjo, Buhari and Jonathan, are bound together by oil. Jonathan attended St. Michael’s Primary School, Oloibiri, where oil was discovered in 1956. Buhari was petroleum minister in 1977, Obasanjo became one in 1999.